Ghastly spaghetti-stuffed pinata visible over my left shoulder. 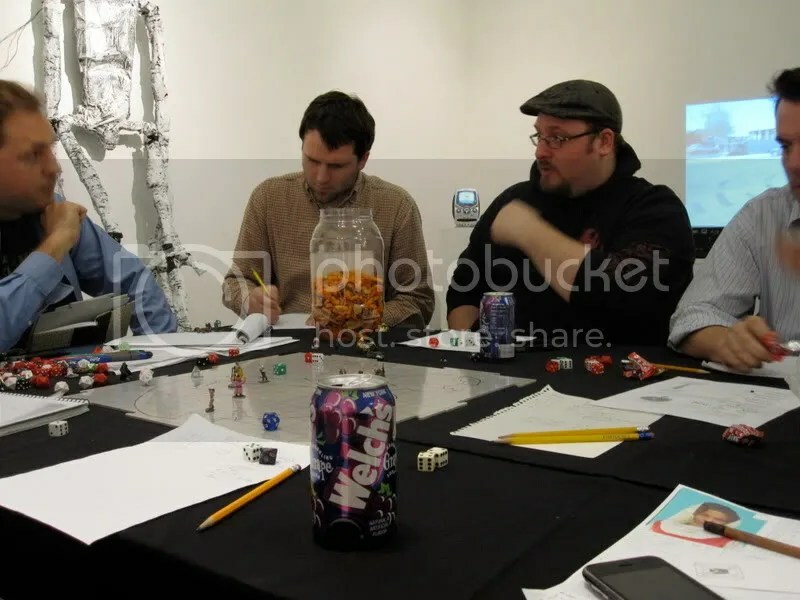 Not every art gallery opening lets you roll a dice to see if you die or get to swing a wooden sword to chop limbs off a giant animatronic undead pinata. In fact, that will probably never happen again; your peak gallery experience happened at age 8, it’s all downhill from here. A similar kind of question I asked a lot was to introduce new PCs when a players’ old one died: “You were teleported here when you mis-cast a very complicated spell. What was that spell trying to do?” Here again the question contains the information I need to establish as GM: you’re here now. What the character is leaving behind can be as wild as the player wants; there’s no risk in saying yes, and a big payoff in that the newly introduced character arrives with a spontaneously created narrative that gives them personality and verve. Reincorporate. Not everything the players invent needs to become part of the fabric of the game, but as GM it’s fun and satisfying to draw from the pool of answers the players have just given you when you do your own improvisation. At the very beginning of the game Allegra decided that their characters were fleeing a giant snake, so when I needed a wandering monster here it was, an enormous serpent with a venomous bite and corrosive blood. Another player decided that the reason a god had cursed his new PC by teleporting him here was that he had accidentally let his pet pig befoul the god’s backyard shrine, so when I was narrating a miss in combat I decided that the charred corpse of the pig got underfoot. Let the players be awesome. This may seem at odds with the fact that the death toll in this game was 100%. Tim Hutchings’ character was the only one to survive the final zombapocalypse; since we were out of time I had him roll a saving throw to see if he made it out of the dungeon alive, and the answer was “no”. instructing players to “describe your horrible death”. This isn’t going to be a run-of-the-mill slipping feebly into that good night; even if you were senselessly killed by a kobold, it will be a grisly senseless death worthy of an accursed hero (and as hammy an actor as you want to be)! displaying my evident relish of killing the PC with a big grin on my face: this is fun for me at least, and in retrospect it’ll be memorable for you too, why not enjoy it now? P.S. At the opening the night after the game, I introduced my son: “Allegra, this is Javi; Javi, this is Allegra, I killed her cleric last night.” I wish to apologize for this grave injustice. In point of fact, her cleric died of willingly drinking from a poisoned fountain, a heroic sacrifice that proved to be the party’s (temporary) salvation. Your techniques and mine are extremely similar- one of the biggest revelations I had in my gaming was that asking players questions about everything is extremely fun, and like you said, letting players hit their own definitions of awesomeness is a lot easier than guessing at it! @James, I think we can expect this will indeed be the last time Javi goes to a gallery opening and utters those words. At least, I hope so. @N. Wright, was that a revelation you hit on yourself or was it inspired by something you read/saw? I do think that the most basic act of DMing is aking questions – “it’s your turn, what do you do?” – and that the process of maturing as a DM largely consists of taking that to its logical conclusion, moving away from the idea of the DM planning a story for the players to experience (like the afterschool kids do, because that’s their idea of how stories go) and towards creating a situation in which it will be fun to see what the players do (based on your experience of roleplaying games as different from stories). In my campaign, there’s a “table rule” I call kill shot. Here’s how it works. Traditionally, the DM narrates everything other than the PCs’ actions. system, I consider special effects to the player’s prerogative. practice follows the needs of pacing. hey! thats Thor from BWHQ in that picture! right?